We assess the fit of your pre-loved bridal gown or your mother’s gown. Assess overall condition and quality of fabrics, laces, trims and fixtures. Inspect construction methods and pattern blocks. Feasibility studies - we consult with you to learn about your plans and overall goals for the gown and your wedding day. We plan changes and discuss possible additions, materials required to achieve your final aesthetic and construction goals. We will work out costing and best practice to achieve final restyle outcome that will meet your expectations and your family needs. After working out your needs and planning your construction goals, we deconstruct your gown and take out only the parts that are extraneous and unnecessary. We do not deconstruct the whole gown unless its necessary to achieve your goals. After deconstruction, we redesign patterns for your new gown. At this stage we cut and recycle existing fabrics from your bridal gown and we can reuse them for the restyle of your new gown patterns. In this stage, we reconstruct new patterns in toiles to achieve your aesthetic goals. Toile forms the pattern for your final gown. Toile can be made in cotton calico or the main fabric. Whichever fabrics chosen for the toile construction will be determined based on your individual project needs. We design the fit & drape the patterns of your new gowns before we enter the next stage. At this stage, we reassemble the new draped and flat pattern with your main fabrics. While we are remaking your gown, we also take this time to check and fortify seams, clasps, zips and fastenings that require attention. Here, we work with you for a fitting consult to ensure your gown fits you beautifully. We also provide you opportunity here to provide feedback , this helps us meet your expectations and answer all your questions. Quality check is conducted here to ensure overall gown lives up to the strict HC standard in construction and fit. At this final fitting, we provide you opportunity to do a dress rehearsal with your mum or loved one to ensure all expectations are met. Garment is then packed and you pick up your gown at this final fitting. Your first appointment is free of charge. This is where we inspect your preloved gown and inform you whether you gown is qualified for the HC Circle programme. After qualification has been approved, we will provide you a quote for your Helen Constance Circle Programme. Just as each bride has individual needs, the cost of HC Circle programme is tailored to meet your specifications and requests. The cost of your HC Circle Programme is influenced by condition of your gown, materials involved to achieve your goals, fitting time , technique and labour required to complete your project. 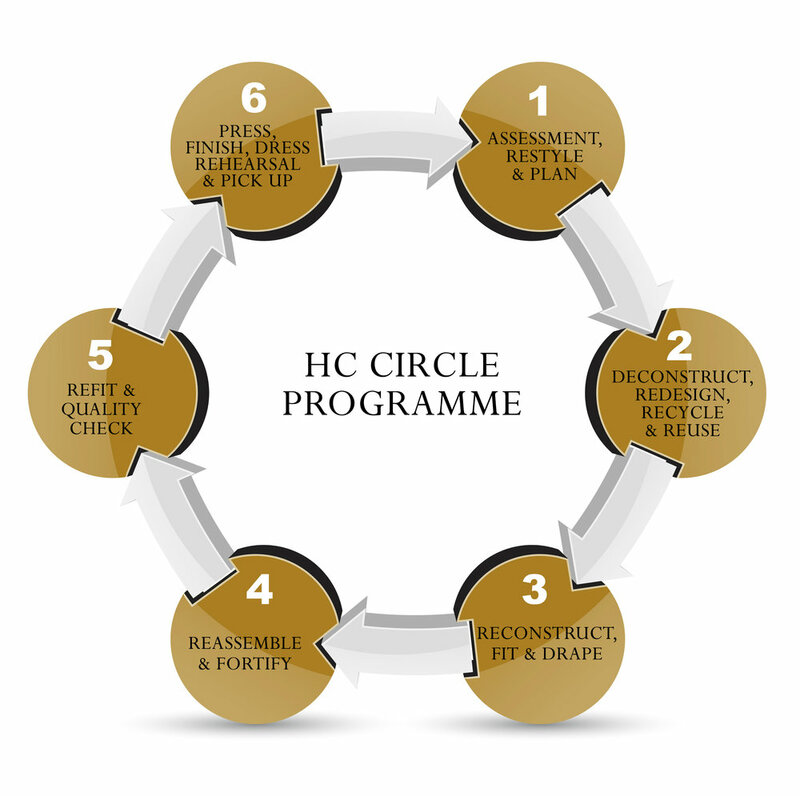 Each HC Circle Programme is quoted without obligation. Each HC quote is valid for 24 hours only. We will honour our quote when you place an order, signed the contract and paid the cost of the programme within 24 hours of the quote provision. We reserve the rights to requote and change the quote after 24 hours. To qualify for the HC Circle programme, you must first book for an appointment. The first appointment is free of charge. You are invited to bring your preloved gown to the appointment. If you can fit into the gown, we will ask that you try on the gown for us to assess the fit. In your presence, we will take time to inspect the gown, seams, fabrics, trims along with zips, clasps and fastenings. We will also inspect the pattern, and construction of the gown. We will ask that you present us with some ideas, photos and goals for your bridal gowns, using our professional experience we will make an educated assessment of whether your goals are achievable and provide you an overview of what is possible and describe the process involved to achieve your bridal vision and all costs involved. Where possible, we attempt to use existing materials and patterns to bring your bridal dress vision to life. If additional fabrics and laces are required we will describe the cost involved for your approval before we proceed to the next stage. We do not sell second hand or preloved gowns. Our HC Circle programme is a premium level service product design to help you reconstruct, repair, resize and redesign your preloved gowns should you choose to wear a preloved gown on your wedding day. All authorised Helen Constance and Empress gowns are new and made-to-order only. We do not buy any preloved gowns or second hand wedding dresses. We are not a preloved gown retailer. The HC circle programme does not offer the service to dye your gown. Colour or otherwise.